English: Indian honeyguide, orange-rumped honeyguide; French: Indicateur a dos jaune; German: Gelbbürzel-Honiganzeiger; Spanish: Indicador Hindú. 5 in (15 cm). Most brightly colored honeyguides. Both sexes adorned with golden caps and more gold on the throat and lower back; female's gold patches not as extensive as male's. Remainder of livery for both sexes is gray and olive-green. Foothills of the southern Himalayas, from Afghanistan to Burma. Forests up to 7,000 ft (2,134 m) above sea level, in coniferous, dry deciduous, and lowland tropical rainforests. No song has been noted. Instead, males stake out territory in forests near rock cliffs where the preferred honey producers, rock bees (Apis dorsata), build their nests in fissures well off the ground. Males feed off wax of chosen nest, while guarding and defending the valuable food source against rival males, and enticing females with the promise of food. Wax and other comb ingredients in rock bee nests; also fly-catch winged insects. Males perch alone in a tree near a honeycomb, erect or hunched, for hours. 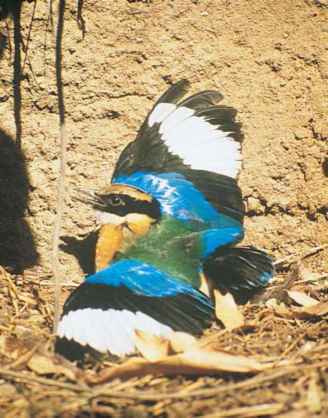 Females parasitize local species of woodpeckers and barbets. Listed as Near Threatened. Threats include deforestation and increased human consumption of rock bee honey.